One of the most famous of all Thai foods, and what I think is one the best soups in the world, is Thai tom yum goong (ต้มยำกุ้ง). 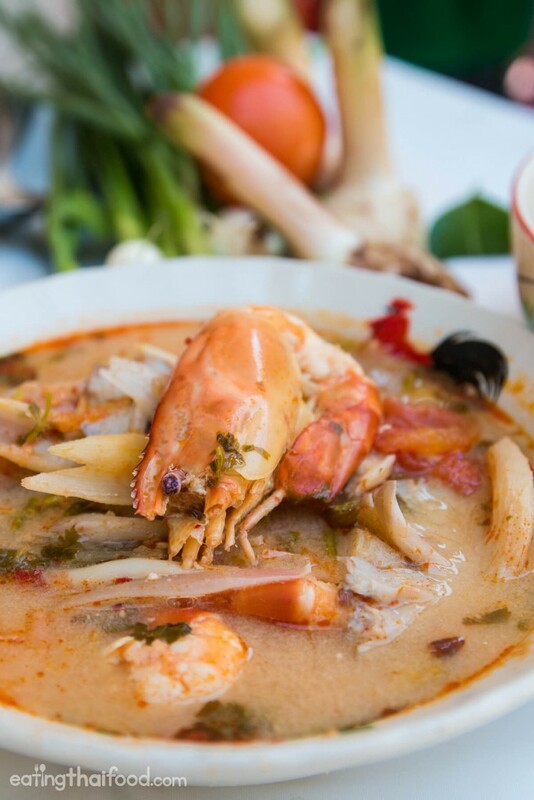 If you’re looking to cook an awesome and authentic soup, try this tom yum soup recipe. This recipe is for local Thai street food style tom yum soup – it’s not the fancy kind – but follow this recipe for the authentic taste you’ll find in Thailand. Exclusive Bonus: Download a Free PDF version of this recipe. It’s convenient to read and print. Enjoy! Enter your e-mail to download your PDF copy of this Thai tom yum soup recipe now. If you love to eat tom yum soup (ต้มยำ), you might already know about two main distinct variations of the dish. Tom yum goong nam sai (ต้มยำกุ้งน้ำใส) is tom yum with shrimp in a clear broth, while tom yum goong nam khon (ต้มยำกุ้งน้ำข้น) is the creamy milky version. 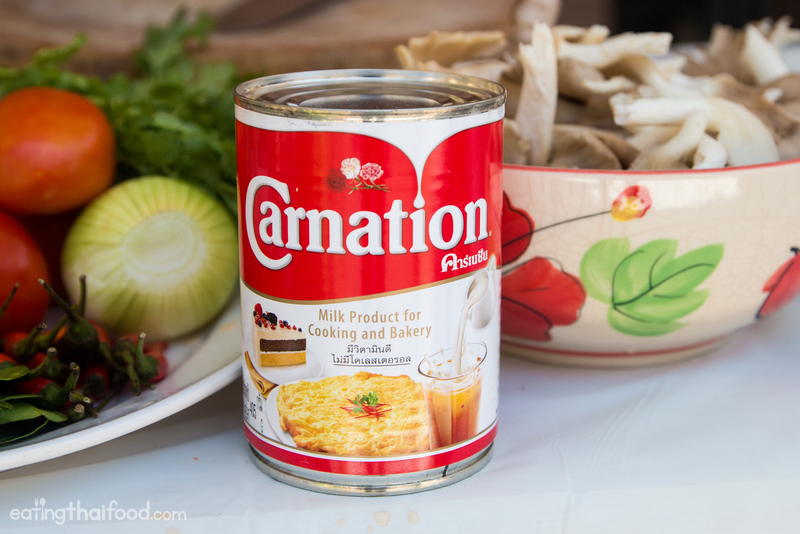 Contrary that many people think tom yum is made creamy with coconut milk, it’s actually nom kream tiam (นมครีมเทียม), which is canned evaporated milk (as opposed to sweetened condensed milk). Enter your email and I'll send you the best Thai food content. Note: If you’re looking for a Thai coconut milk based soup, check out my tom kha gai recipe. 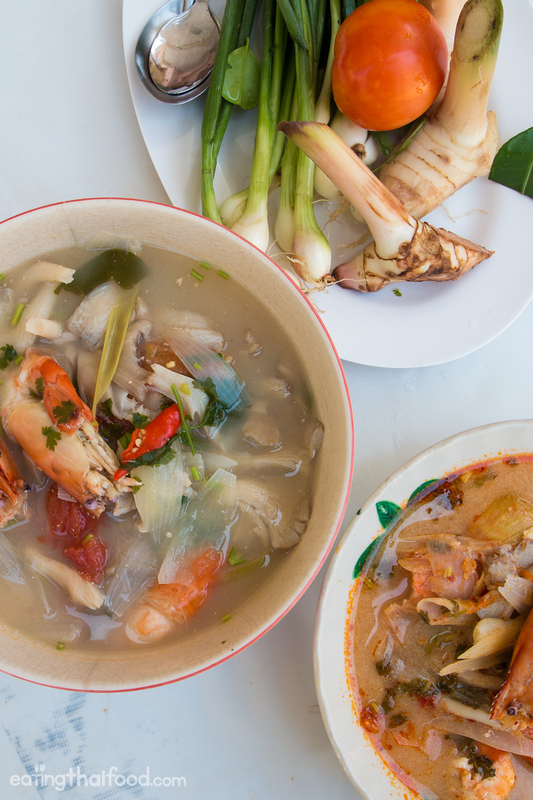 In this tom yum recipe, I’ll be showing you how to make both versions, depending on which style you prefer (they are both common in Thailand). 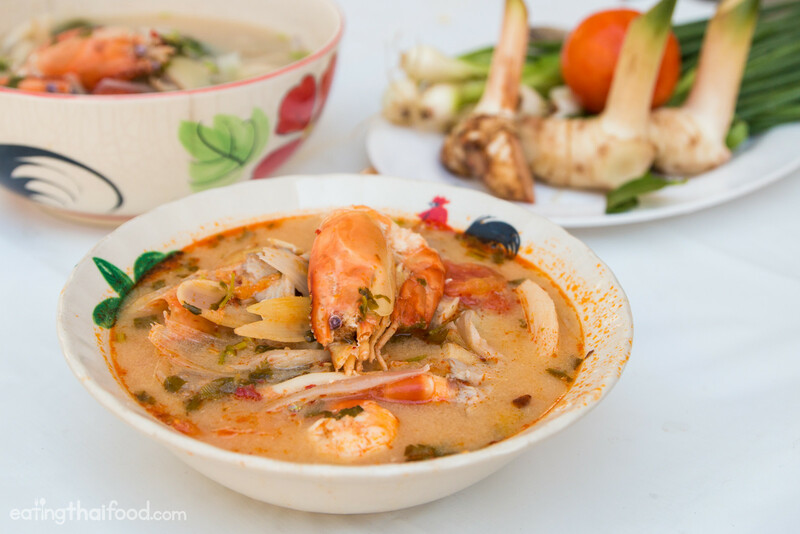 Goong (กุ้ง), or shrimp is one of the most popular things to make this soup with, but you can also choose to make tom yum with a mix of seafood like squid, or with chicken, or fish (one of my favorite versions too). When I went to the market before making this recipe, there was a nice supply of goong mae nam (กุ้งแม่น้ำ), or freshwater shrimp, so I had to go for them. But you can really use any kind of shrimp or other meat of your choice. This trio of Thai ingredients is what really gives tom yum its flavor, and without them you would not have a complete dish. Other ingredients are still important though, especially Thai chilies (พริกขี้หนู), mushrooms (เห็ด), cilantro (ผักชี), tomatoes (มะเขือเทศ), sweet white onions (หอมใหญ่), lime juice (มะนาว), sugar (น้ำตาล), and fish sauce (น้ำปลา). Full list of ingredients listed in the official recipe section below. I like to use something called nam prik pao (น้ำพริกเผา) in my recipe for tom yum, and it’s especially necessary if you make the creamy version. Nam prik pao (น้ำพริกเผา) is basically a Thai roasted chili sauce that’s packed with flavor and usually bought in a can these days. Ok, so let’s move on to the full recipe now. Tom Yum Goong (ต้มยำกุ้ง) soup is one of the most well known dishes in Thai cuisine, and in this recipes you'll learn to make the authentic Thai street food style version. There are 2 different types of tom yum, the clear version and the creamy version, and there's directions on how to make both types. Enjoy this recipe for tom yum. Be sure to watch the video here. Coarsely break about 10 kaffir lime leaves - no need to cut them, just tear them - which is going to help release their flavor. Boil your soup with all the herbs in it for about 10 minutes, and you can go ahead and toss in the shrimp and turn the fire to low. Take two roma tomatoes and two small white onions and slice them into wedges - you want them to be big and chunky. Then go ahead and add them to the tom yum. Boil the tom yum for about 2 - 3 minutes. Tom Yum Goong (ต้มยำกุ้ง) is a Thai soup that's meant to be eaten with a variety of other Thai dishes. It's not normally eaten as an individual bowl of soup, the way it would be in Western cultures, but instead it's a communal dish that goes together with other dishes and eaten with rice. See more of our authentic Thai recipes here. For myself, I like both versions of tom yum, and it sort of depends on which mood I’m in. Overall, 75% of the time I like tom yum goong nam sai (ต้มยำกุ้งน้ำใส clear version) because it’s so pure and clear and tastes quite healthy. Also, the flavors of sourness and the the heat from the chilies are usually a little more pronounced in this version. Tom yum goong nam khon (ต้มยำกุ้งน้ำข้น creamy version), can be excellent as well. It’s richer and creamier, and usually a little sweeter, and like I mentioned, the creaminess usually tones down the chili heat and sourness a bit. I hope you enjoyed this tom yum soup recipe. Be sure to give it a try when you have a chance, and let me know what you think. Do you like your tom yum clear or creamy? Also, be sure to check out my of my authentic Thai recipes here. 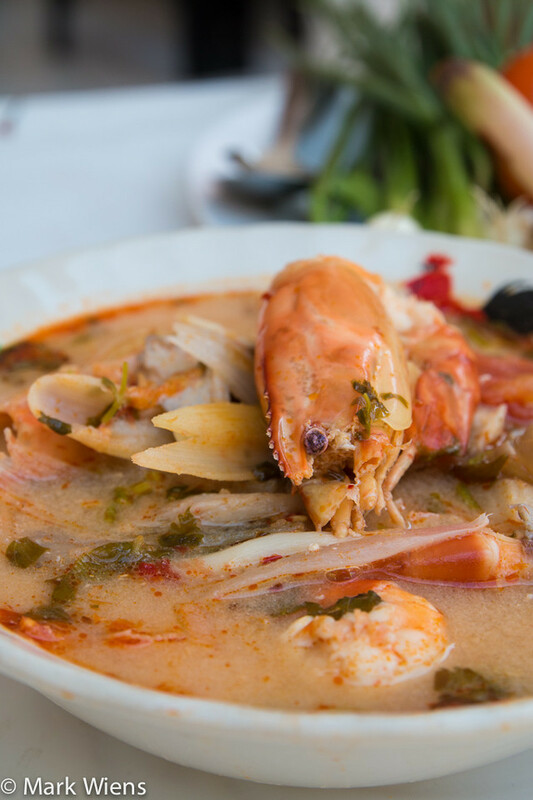 Free Bonus: Click the button below to download a PDF copy of this tom yum soup recipe (for FREE). It’s convenient to read and print. 280 comments. I'd love to hear from you! thank you. I really enjoy how nicely you show all the steps how to make the Tom Yum. I had all the ingredients other than cilantro and tomatoes. Used parsley and ketchup instead. Added chicken pork dumplings. Really good. Using the leftover broth for rice tomorrow. I made this tonight with just a couple of substitutions to be closer to what I used to get at my favorite Thai restaurant (long ago burned down) in Memphis. I used chicken broth for half of the liquid, skipped the mushrooms, added a teaspoon and a half of Thai chili paste and a half teaspoon of the oil, added some chopped Thai basil, chicken thighs that I cooked in the broth, and thinly sliced the white onion. I strained the broth before adding the sliced onion, sliced chicken, tomato, Thai basil, cilantro and chili paste. It turned out just as I remembered! Do you eat the khafir lime leaves, lemongrass and galangal? No, not whole. I cut some of the galangal and lemongrass very finely so it cooks into the broth. Tom Yum is one of my favorite dishes from Thailand. Since my wife just immigrated to the US from Thailand, she brought along some fresh chili paste she made while visiting family in Surin. Everyday that I work she prepares such amazing and delicious Thai food. Hi, how do I DIY the chilli paste for the cremy version. Dont think the canned chilli paste is available where i live. Thanks! I’m looking forward to making this!!! Truly authentic! I have tried the Nam Sai and its perfect! Thanks! Im not sure if I remember it right. I think my Thai friends used tamarind for the sour flavor. Is it right? My good I miss this soup. I lived more than 8 years in Thailand and moved to the Philippines. I I will try to make Tom Yang Gung myself. Hope I can manage to do it. Actually I miss Thai food so much I allmost go cracy. Food here in the Philippines is boring and very simple. I just made this for lunch,I had a craving for a home made Tom Yum. This was the easiest and one of the best I have come across. YUMMMM. This is soooohhh good! And so easy to make! Thank you for sharing your recipe n showing us how to make it! Good grief this was good! I’m jonsing for this soup and decided to make it. I substituted the zest of two limes and sliced ginger. I deseeded the chilis. I used 6 T of fresh lime juice. And only two stalks of lemon grass. The heat was perfect and soup fantastic. Better than my towns only thai place. I never seen thai people used garlic for Tom Yum. I’ve been to Phuket few times and this soup is my favourite and I have allergy to garlic. They Use ginger and chili, coriander herb, mushrooms, shrips, lemongras, galagal and kaffir. I just made this for dinner and the flavor is amazing! I admit I didn’t have galangal so I used ginger and nam prik pao instead of fresh chilis (yikes! I know…) but it still came together so well. It is the first time I have been excited about a Thai dish that I have attempted, usually the flavors are lacking. Your video really helped. I made the clear and creamy version and can appreciate both. Thank you for sharing this recipe! This is actually one of my favorite soups! My mom usually cook this when I’m sick and it really makes me feel better. What I like about tom yum is it actually has all the taste that you would like in a food, the soup is a combination of sour, spicy, and its perfectly creamy. Keep filming and penning the recipes. Thanks so much for this recipe! I made the creamy version and it was absolutely delicious. I can see that it’s going to be appearing often on the dinner table. I’m looking forward to trying the many other recipes you’ve been so kind to post. We loved this recipe! Couldn’t find the kaffir leaves but didn’t seem to make a difference! Also loved you video! WAY too much lime juice. I only used half the suggested amount and it still ended up tasting like a Tom Yum cleaning solution – and I love the taste of lime. Very disappointing. Waste of time and ingredients. I used fresh Lemongrass and Galangal, but dried Kaffir Lime Leaves. My thai chillies were green/unripe so the spiciness was weak. I followed the recipe exactly, and it didn’t come out as well as I’d hoped, so I dumped a spoonful of Nam Prik Pao. I’ll give this recipe another try, but I’ll probably boil the herbs a bit longer too. Thanks for the recipe! It’s definitely the best I’ve tried so far. 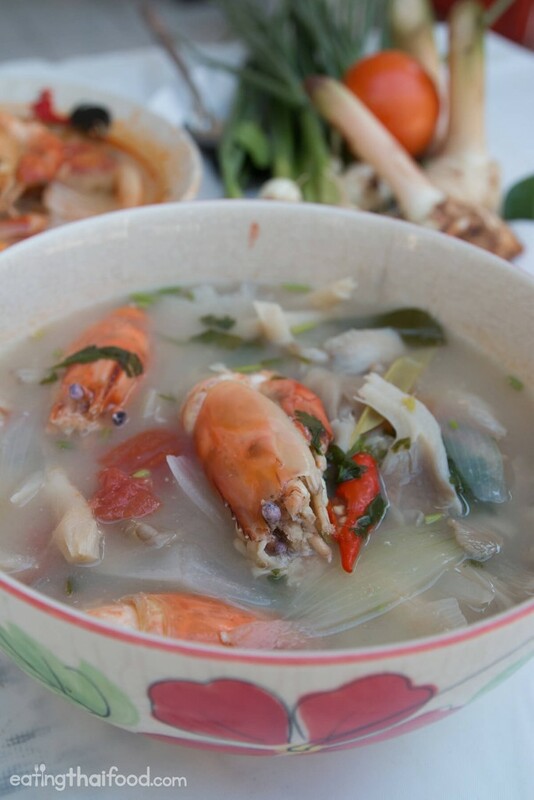 My wife is thai, she always cook this tom yum soup for me, is a must try soup in thailand. Great recipe….its so easy….I had no idea that Tom Yum soup was so easy to make! I made the clear version with shrimp and squid and it turned out perfect! Thank you for the video….I was not aware that lemon grass and kefir leaves needed to be bruised! I will try some of your other recipes. I love this recipe. I have not made the creamy version because I can not get ever how quick, easy and delicious this recipe is. The recipe is definitely spicy and I love spicy food, so if you don’t like your food spicy i recommend only using 2-5 chilies and/or taking all the seeds out (make sure you wear gloves if you do this. I have not yet made this recipe with shrimp and have used vegetable broth or just plain water with whatever protein I have around and all have turned out delicious! thank you for posting such a great and authentic recipe. It really tastes better than the very best I have had in restaurants. This two versions of my favorite soup are amazing. Thank you for the video. It was very helpful. “It’s a little spicy” you said… A “little”??? It was very spicy . Originally, I planned to make both version but it was so spicy that I ended up with just the creamy versiom as the evaporated milk toned down a little the heat. That’s a personal preference and nothing to do with you. Otherwise, the soup came out DELICIOUS! Easy to make and easy to follow. Thank you again! Great to be able to make this from fresh rather than supermarket jars etc. 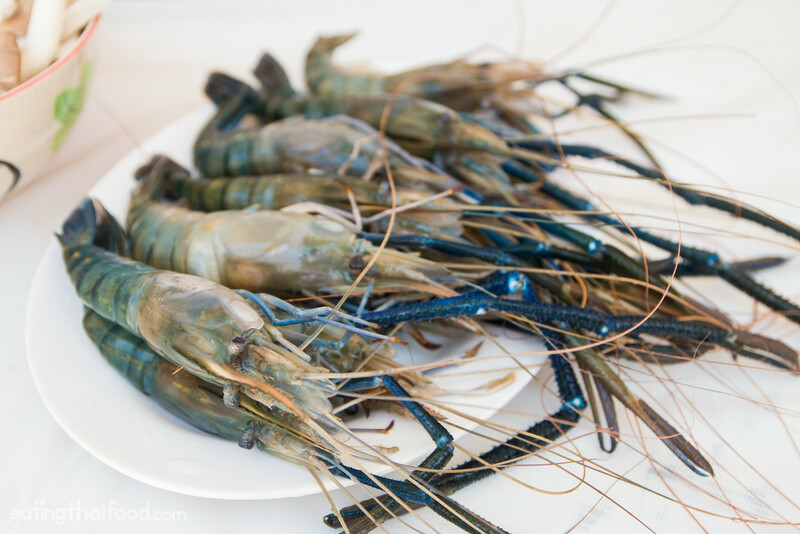 the recipe and the taste is beyond all criticism, but how is your opinion about the shrimp production in Asia and Thailand? If I buy a shrimp dish in Bangkok what quality can I expect? Once I bought frozen shrimps from Thailand. I got the runs from the antibiotics in it. I tested it sveral times. i tried your TOM YUM SOUP the clear one and The creamy one too , MY BOYS AND their families went crazy and want me to start cooking for them again !! Thanks a lot for all the stuff you post, this website is my go-to for thai food, and I like the way you put up recipes, with some more description and stuff, awesome work, keep it up! The only suggestion I have would be to use scales and units more. Your recipes always turned out good when I made them but sometimes somethings were off, especially long it took me to figure out the coconut milk amount/water solution, but that is largely a matter of different brands available around the world. However I figure it would be more clear if you gave (at least estimated) mass of what you use. Take this recipe for example. It said “8 – 12 tablespoons of lime juice (10 – 15 limes)”. Thanks once again, keep up the good work and take care! Mark, this is one of my most fave Thai soups. The only problem is, where I live, we don’t get kaffir lime leaves or nam prik pao. So what alternative you could suggest for these 2 ingredients? I made the creamy version of this soup but with chicken and WOW!!! It was lovely!! In the recipie you mentioned that you saved half for clear and half for creamy . Just to confirm if I want to make the entire recipie creamy I should double the paste and milk in the ingridients list correct ? Hi. Love the sound of this recipe. Do you skice the garlic? I made the clear version and its awesome!!!! Hey Momoko, glad you enjoyed it! Can I ask a question? Is there another version with chili paste but no milk? Hi Momoko, thank you very much. Usually the traditional version would be made with just the shrimp tomalley, and then fresh chilies. But I’m not sure of another with a different type of chili paste. Making this soup to your own taste with spicy sour salty including all of the ingredients, is the best way for each person to enjoy it?? And having extra spice sour salty on the side is an easy way for each person to season their own bowl of soup… Do you agree?? I personally love it with coconut cream…and extra coriander and spring onions..
It’s hard for me to tell whether the soup needs more fish sauce or sugar, as I don’t cook with them very often. Can you share some tips on how the soup would taste if it needed either? Really AWESOME. Am learning something new every day. Love your presentations, as they are to the point and easy to follow. Every time I cook your recipes I get an 11 out of 10. If not, they dont get invited back. Jokes aside, they love your meals. I am SO EXCITED!! I used to have a little place I went to in my hometown for Tom Yum when I was feeling under the weather or downright sick. Now that I’ve moved, nowhere seems to make it quite the same. This recipe is IT, though!! I’m making it a second time for my little sick guy, so I definitely added less spice, but he loves it, too. Definitely going to be a staple in our house. Thank you so much for the recipe AND the amazing details!! You have a wonderful collection of recipes. They all look great. I’m getting my ingredients ready to start making your yummy dishes. I could only find dried galangal and having a hard time finding lemon grass, I haven’t been able to find the kaffir lime leaves either. I live in Florida. I did find a lemon grass paste, don’t know how well this would work?? You have the best descriptions of your recipes and your videos are really informative. P.S. I saw you video with Andrew Zimmern, very cool. I love his show. I have made this twice and its so delicious, thank you so much. Awesome! Eating this right now. Thank you! Great to hear that Brian, enjoy! Hola Marc. Saludos desde Barcelona. Sensacional tu trabajo culinario e informativo de tus viajes. Soy un amante de la comida thai. Probe el Tom Yum cremoso y me salio de maravilla. Tengo un problema quiero cocinar FIDEOS CON CANGREJO O CON GAMBAS pero no me sale del todo bien. Puedes ayudarme? My favorite! Thank you so much for going beyond the foods and cities, and providing recipes! Much appreciated, as I love asian food of all kinds. Hi Patti, you’re welcome, thanks for your support. Can I use anchovy paste instead? Hi Fred, yah I think that would be fine, or just feel free to reduce the fish sauce in the recipe. My wife doesn’t like flavor of fish. Is there a substitute for fish sauce. Hey Atul, instead of fish sauce, salt would be the next best option. Enjoy! I love Tom Yum and have tried many recipes that I’ve found online. I am allergic to shrimp so I must skip that, but then wonder how that impacts the flavor. The broth is my favorite part: Close-my-eyes delicious. I made both versions and we love them both!!! Thanks for sharing and giving me Thai dishes without going to a restaurant. It’s so fresh and clean! Awesome to hear that Michelle, thanks! Could I substitute the evaporated milk with sweet coconut milk? Hey Quan, that’s not typically done in Thailand, but yes, feel free to try that out, could be very good! We made this a couple nights ago and it was AWESOME!!! Thanks so much!! I cooked up some rice noodle and served the clear version over them! So tasty!! Great to hear that Leah, glad you liked it. Sounds good with noodles as well! Hey Fahmi, thank you very much, glad you enjoyed this recipe. For the roasted chili paste, it’s mostly dried chilies, shallots, garlic, and sugar I think, all roasted down. I’m not totally sure how to make it, but I will try to make a recipe in the future. Thanks! Thanks mark for the reply… I’m awed and inspired through your travel video in youtube around the globe… s Will definitely try another recipes that you published here. and looking forward for another great recipes..
You’re welcome, thank you Fahmi for all your support! Tried this in a Thai restaurant , didn’t really know what I was eating but it was great. Was in Thailand in 1968, 1969, I am very envious. I am sure it has changed. Hi Terry, great to hear you got to try some tom yum. Normally the lemongrass, galangal, and kaffir lime leaves, are just in the soup for the flavor, but not to be eaten. Enjoy! I didn’t know those ingredients weren’t normally eaten. But, as the lemongrass and kaffir lime leaves were quite tough, I didn’t eat those. However, I did end up eating the galangal as it was quite soft and yummy, lol. Hey Leah, it all depends on the age of the galangal — when it’s young it’s really good to eat, but the older galangal can be more tough. Glad you enjoyed it! Awesome. Thank you for the video. I started with the clear soup. Creamy next time. Great to hear that Doria, glad it turned out well! Made it and ate it for the first time using this recipe. It was awesome and everyone in the family wants it again. One question, should you strain the broth from the lime leaves, lemon grass and galangal? Did I miss something there on my maiden voyage? We ate around it and it was still awesome. Thanks!! Not at all! It’s always been in the soup I’ve gotten. Thank you for sharing this recipe! My first time making it and your directions allowed for easy adjustments. My hubby loved it and said it’s better than buying from our local Thai spot. Hey Michelle, thank you for making this recipe and glad it turned out so well! My bf’s all-time favorite. We order this dish every time we’re at Thai. So I decided to make it myself. Super easy and quick!!!!! Turned out super duper yummy. I sub’d lime with lemon juice since I didnt have any limes, AMAZING still!! Hey Wendy, that’s fantastic to hear, glad it turned out so well. And good tip about lemons! can’t wait to try this recipe, thank you so much! You’re welcome, thank you Claudia! Hi Lim, I think most of the ingredients in this recipe should be available at local markets in Malaysia. I have tom yum paste and dried herbs. 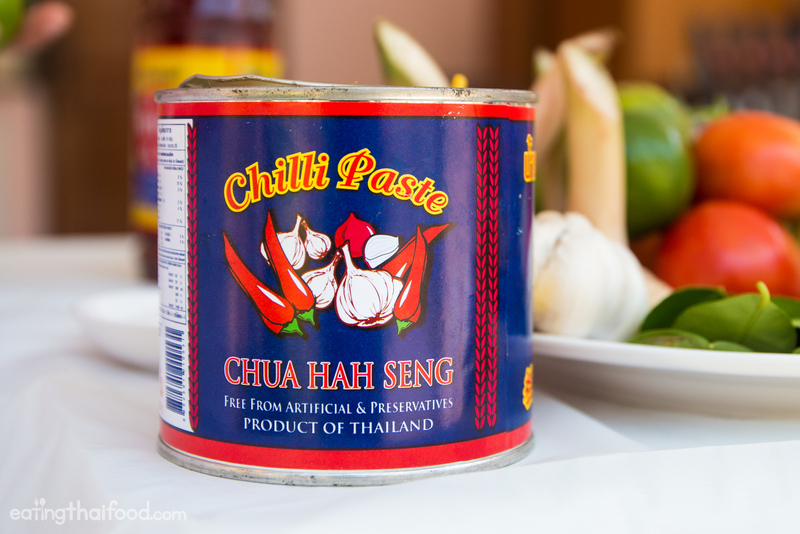 How can I make tom yum goong soup with the paste and the dried herbs? Hi Fauzia, tom yum paste is likely just a combination of chillies and galangal and lemongrass. But I’d recommend sticking with fresh herbs to make tom yum for a better taste. Was searching for a good authentic Tom Yum Soup recipe, when came across your website. Thank you for such a thorough explanation and step by step guide:)Super excited to try it out!! Hey Jelena, thank you for reading this. You’re welcome, hope you enjoy it! I like your 2 versions of Tom yam Goong. We eat a lot of Thai food n yours do look authentic so I am going to try your recipe! Hi Erica, thank you very much, and great to hear you enjoy Thai food! My husband love tom yum soup. I think he prefer the creamy version. I hope i can get that prick pao paste here in qatar but what if its not available here,do you have any substitute for that chili paste? Hi Grelyn, good to hear from you, glad you and your husband enjoy prik pao. For substitute, you could either omit it, or you could make prik pao with dry chilies and shallots. Hope you enjoy it! Instead of evaporated milk use coconut milk. I mean if you’re allergic to coconuts please stick with the evaporated milk. 10 Thai Chilis were way to hot. I can handle a lot of heat but it ruined the dish. The flavors were amazing I just I would of error on the side of not putting them all in. Hi Shelly, sorry to hear that. 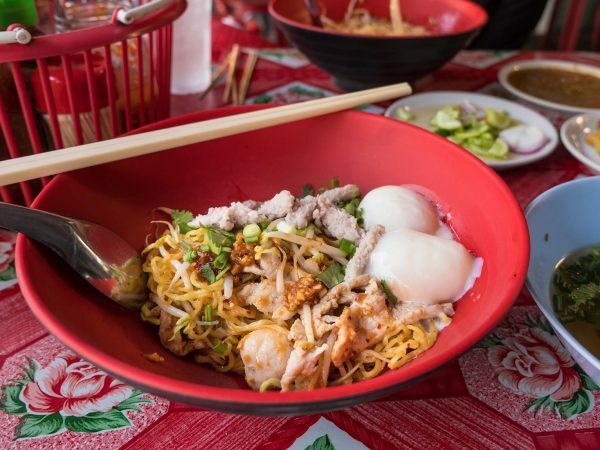 Through my recipes, I’m aiming to provide a realistic amount of ingredients of how you’d find the dish in Thailand. But ingredients can be relative to location (like limes or chilies are not all the same strength depending on location or climate), and that’s why Thai food is all taste based, and made according to ones own taste. Hi Reem, awesome to hear from you, glad you used to stop in Bangkok and go straight to tom yum! Normally in Thailand coconut milk is not used in tom yum, but it’s used in tom kha. But you could try coconut milk if you’d like, and yes just replace it. For kaffir lime leaves, you could add just a squeeze of lime. Thank you very much Maribel, great to hear that! I like the clear version, though if I order it at a restaurant here (in South Africa) I always have to explain beforehand as they normally make the creamier version which probably caters for the western palate more. Great to hear that Lerushka. I tried your tom yum recipe (the creamy one) and a little less of chili, my wife and children love it!! I’ve had Tom Yum Goong Nam Sai a number of times and I have never had it without Tamarind. Your recipe doesn’t even mention it. I have many Asian friends who make it and all use it. I will certainly try yours but I can’t imagine it without tamarind – Go figure. After living in Thailand, (Chiang Mai) for the past 2 years I usually have to look up the food my girlfriend cooks on your site, just so I have an idea what I’m eating. Tom Yum Goong is one of my favorites. Of course I really like it with equal amounts of squid and Shrimp. Great recipe! I love watching all your receipes they are clear simple and very tasty. I love to cook, i am french most of my cooking is french cuisine. I am starting to learn step by step Thai cuisine and I really love it. My dream is to meet you mark in december when i will be in Thailand. Thanks for your recipe and TOM YAM is the best!!!!! I just tried to make this tom yum goong nam sai and it was excellent! Also, surprised that its not complicated. Thanks for sharing your recipe! This is my 2nd recipe from this site. The first was the steamed fish in lime and chili sauce. Both were soo good!!! Hi Shalina, great to hear you love tom yum goong, and glad it turned out so well! Thanks a lot for your delicious recipes and your great job. Tried making the clear version of the soup couple of days ago. Preparing the creamy version today. I am never going to a Thai restaurant in North America again for this soup. I love my very own Thai kitchen & your recipe. Hey BB, haha, that’s awesome, glad you enjoy it! I was so happy to have found all these ingredients today. I have been searching for a while :) the recipe is fantastic! Thanks so much for sharing! Hi Claire, great to hear that, enjoy the cooking! Looks good, but palm sugar for authenticity. Not white or brown! Thank you for posting and sharing the recipe. Great flavors for hot and sour soup. My Lao mother is a wonderful cook, but not the best teacher for when you are learning to cook for yourself. You’re welcome Mali, glad this is helpful! Mark. I just made and ate this. It’s perfect. Thanks! Awesome to hear that Christine, glad you enjoyed it! Hey Stuart, thank you very much, I can’t take credit for that idea… it’s done like this all over Thailand – but I agree, it’s a great way to cook shrimp! HI MARK, I EAT TOM YUM SOUP CHICKEN IN MBK BANGKOK ONE WEEK AGO, I CANT FORGET THE TEST OF THIS SOUP. ITS WAS THE MOST APPETIZING SOUP I EAT . I WILL BE VERY GLAD TO GET THE RECIPE OF TOM YUM SOUP CHICKEN. HI MARK, I EAT TOM YUM SOUP CHICKEN IN MBK BANGKOK ONE WEEK AGO, I CANT FORGET THE TEST OF THIS SOUP. ITS WAS THE MOST APPETIZING SOUP I EAT . I WILL BE VERY GLAD TO GET THE RECIPE OF TOM YUM SOUP CHIKEN. Hi Kochy, good to hear from you, glad you enjoyed tom yum so much. For chicken, just substitute the shrimp for chicken, and I think you can add the chicken right as you start boiling the soup. Enjoy! Do you add salt? I didn’t see it in the recipe. Please let me know. There’s no need to add salt, as saltiness comes from the fish sauce. Hey Patricia, often for tom yum it’s fish sauce that makes the soup salty, but you could add some salt if needed. Enjoy! I did the Tom Yum Goong Nam Khon the other day (though I toned down the heat a little bit, my family couldn’t really take too much of it), and my God, it tasted amazing! For a while I imagined myself being good enough to cook a proper Tom Yum soup at a local Thai restaurant, haha! It is surprisingly simple to prepare, with end results that definitely exceeded my initial expectations of it (well, it was easy to make, I thought I’ll have to go through kitchen’s hell to get this done decently). Thank you so much for the recipes! Definitely will come back to refer to it again and make another in a bigger bowl! Hey Oddy, really happy to hear your tom yum goong turned out so well, thanks! You aren’t farang you are thai , Your Videos are amazing. This looks amazing! Can’t wait to try it !! Thanks Jade, let me know how it goes! Oh! And absolutely five stars! Hey Anastasia, thank you very much, glad you enjoyed it! thanks so much for the recipe! you make it easy! Hey Chris, you’re welcome, thank you! I would like to see some kind of heat scale attached to each recipe, say from one to ten like Resturants use. This would help with people like me that like some heat but don’t want to burn our lips off. Love your recipes and video’s keep up the good work. Arlington, MA ( from CT) for some good tum yum. Thanks again! OMG…first time making this. It’s so amazingly good! Thanks Mark!!! Hey Karen, glad you enjoyed it, thank you! Hi Tara, you can choose how you want, and if you don’t want to include that, that’s fine. Hope you enjoy it! Hi Mark, I haven’t made this yet (next week!) but I have a question. I just got some Tom Yum soup from a local authentic Thai place. The veggies (broccoli, carrot, onion) were all very crispy, as though they were stir-fried then tossed into the soup at the end. Is this a variation you’ve seen? I definitely liked the texture a lot and the soup was delicious. I just want to let you know that you are my favorite human being on this planet. I LOVE Thai food and you have made it so simple with detailed ingredients that I’m now able to try on my own!! 1,000 thanks you’s for your amazing website!!! Hah, thank you very much Risa, really appreciate your kind comment, and glad you love Thai food!! What’s up Mark! I just went to Thailand a couple of weeks ago and your videos helped me alot during my stay. And yes tom yum is the first food i ate, and you’re right! It really is one of the best soup in the world. Now it’s time to make my own. Thanks a lot dude. Hey Erfan, great to hear from you, glad you had a nice trip to Thailand and enjoyed the food. Glad you love tom yum! Thanks for sharing the recipe, Mark. I tried out your recipe and my whole family love the result. Real tasty Tom Yum, ok.
Great to hear it turned out so well, thank you for sharing! Made a a combination of this and another recipe tonight – was absolutely delicious. I crushed the garlic, used half a tin of italian roma tomatoes – it was very authentic, I’ve been to Thailand many times, thanks Mark really good website it was very helpful. My family raved about it ! Hey Dave, nice to hear from you, thank you for sharing. Glad it turned out so well, and greetings to your family as well! Thank you,will love to hear from you and preference is only vegetarian no meat. Great taste but the lemon grass was really tough and chewy and stringy. Next time I will leave it whole and take it out before serving. I would also slice the garlic next time too. They are a bit much whole! Hi Rich, sorry about that, I should have mentioned in the recipe that the lemongrass and galangal are not typically eaten, but they are just used as aromatics for the soup broth. Good idea to just leave them at the bottom of the pot and just let me rest there releasing all their flavor. Sounds good! Hi Mohamed, you’re welcome, glad you love tom yum goong as well. Easily my favourite Thai dish. So easy to make too. I usually make enough for two people. Can you just reduce the quantity of ingredients for a smaller batch? I’m guessing this isn’t the sort of soup you could freeze or store in the fridge over night? I always make a small amount so never really needed to and I can’t stand the jarred pastes. Hey Dan, glad to hear you enjoy tom yum as well. Yes, you could reduce the ingredients, that would work fine. It really does taste best to make a fresh batch, but if you’re pressed for time, making a bigger batch an eating it for a few days does work alright. Enjoy! Thanks for sharing Dan, glad it turned out well. Nicely done with the massaman curry as well! This was easy and fantastic. I found all the ingredients and my local thai grocery. I loved that the ingredients could be roughly chopped and added. I used cooked shrimp so I thawed it separately and added it for the last 5-10 minutes of cooking on low. For Americans who still like it spicy, I used only 5 chillis and deseeded them and it was still the right amount of heat. Hi Robin, happy to hear you love tom yum and enjoyed this recipe, and thank you for your extra tips, sounds great! Glad you enjoyed it Rajneel! Another great recipe, thank you! Your larb recipe is a staple at my house. This soup will now be in regular rotation this fall. Great to hear you enjoyed it Peter, thank you! really great!!!! followed your recipe and was amazing thanks so much!!!! Hey Tom, excellent, glad you enjoyed it! Cool to hear that, thanks Chris! I tried the recipe and it was excellent. I live in New Zealand and I am lucky enough to have kaffir lime leaves and lemon grass in the garden. My family loves the soup I made. I use 4 limes and only 3 chillies. I also added a tablespoon of instant paste just for flavoring. The only problem was my husband spent some time to pick out the lemon grass, kaffir lime leaves and the galangal when eating them. I think I will have to strained them next time, but I am absolutely making them again and again. Hey Subur, I’m happy to hear your tom yum turned out so well, glad you enjoyed it. 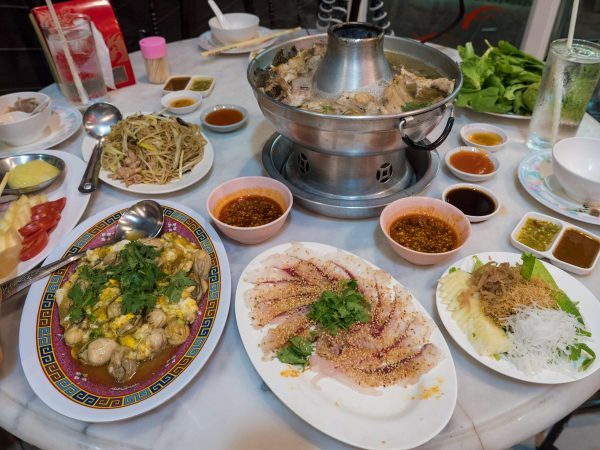 Typically in Thailand the lemongrass, kaffir lime leaves, and galangal all just sit at the bottom of the bowl of soup – maybe just to keep the aroma, and so you know they are within the soup – and they are just eaten around without being eaten. But straining them out would work well also. Thank you again for sharing, and keep cooking Thai food! Hi Mark, great to hear from you, glad you love tom yum as well, and with pork ribs that sounds delicious! I loved your delightful video on making tom yum! Trust me, nothing hits the spot better than a hot bowl of soup during the cold Tasmanian winter here. Last week, on the spur of the moment I decided to throw in some mussels and two blue swimmer crabs into the soup. My husband loved it! A problem I have faced on and off when making tom yum is that the soup tasted a little too fishy for my liking (despite using no more than two tablespoons of fish sauce). I wonder if there is a way to attenuate this odour? Maybe I’m not using enough kaffir lime leaves/lemongrass? Thank yo for watching, glad you like to cook Thai food as well. I think it might be due to using the amount of lemongrass and galangal. And also make sure you add the lime juice at the end of cooking and make sure it’s sour enough – I think that will combat the fishiness of the fish sauce. It could also be the brand of fish sauce you’re using, some taste fishier. Usually in Thailand we use Tiparos brand, which to me is usually quite smooth. You could alternatively add just 1 spoon of fish sauce and then use salt. I tried your recipe and it was great! just like the restaurant. I played with it however by only using 5 limes and 3 chillis. I also like to add the nam prik pao even to the clear soup to get those little red oil bubbles on top and to get the extra flavor. A note to other readers: I had tried many times before to make Tom Yum Soup without having access to keffir lime leaves and galangal. Finally, after much searching I was able to find some where I live, and I have to say that it is not worth making if you don’t have these ingredients. You may be able to switch out ginger for galangal, but without keffir leaves just don’t waste your time. It won’t be Tom Yum. Hey Talal, great to hear from you, glad you made tom yum and you enjoyed it! Also, thank you for the tip for other readers. I like Tom Yum Soup and would love to make it at home.. problem is I can’t make it with shrimp or fish due to family food allergies.. Can this be made with chicken, beef or pork? and would it have the same rich flavor and depth. Hi Shayne, good to hear from you and that you like tom yum. Yes, tom yum is great with chicken, and I’ve even had it in Thailand a few times with beef. Give it a try! Sounds good Lawrence, let me know how it goes! Recently I was holidaying in Singapore with my family. I had Tom Yum a few times and got addicted. Just went through the net and found your recipe. Came back to Srilanka which Is my native place and tried your excellent instructions. Trust me, it came out so well even my family did not believe me that I did it. Thanks a million for your comprehensive vedio presentation, we now enjoy real Tom yum. I am a senior Cancer Specialist doctor in Sri Lanka. Would take this opportunity to invite you to my country for a vist. Will look after you with no fuss. Hey Jayantha, haha, thank you so much for sharing your story! Glad you love tom yum as well. I visited Sri Lanka about 4 years ago, and it still remains one of the top countries I’ve ever visited. But I’d love to come back again, I will let you know, thank you for the invitation. Thank you again and keep cooking Thai food! You’re welcome Charles, glad you like it! Hey Paul, thank you very much, glad you love to cook as well, and that you can get many of the ingredients. I’ll let you know if I ever had the ebook printed. Thanks again! kaffir in the broth or leave them there? the perfume is really respectable and it would make a change from veggie/chicken/beef stock. I thought of using it in a risotto. Hi Kid, thanks for stopping by. Yes, you can remove those herbs if you like. Normally they would just sit at the bottom of the bowl, on not be eaten, but you can remove them all the same. I think that’s a great idea, enjoy! Sorry I am not English native speaker, I just find hilarious the word goong, i tried every way to pronounce it and it doesn’t rhyme correct to me, may be my English no good. My suggestion is try the real word KUNG it might sound right. Thats what is used in Thailand. My apologies if I have offended you or any reader. Hi Sin, no problem, thank you for the suggestion. The reason I spell it goong is because “kung” is ambiguous, it could be pronounced “koong” or “kung, as in sung.” So I spell it “goong” for the long ooo sound. But that’s one of the biggest issues for me translating Thai into English, there’s no standard. Excellent recipe. Made it as shown except only used about one lime total. I also cut the heads of the prawns and let those cook early on. Then took them out near the end and added the tails so they didn’t over cook. Enjoyed it both clear and with the condensed milk/chilli oil. There I found even a single tablespoon of the condensed milk was enough as it got too creamy otherwise. Hi Jesse, glad to hear you enjoyed this recipe. Thank you for sharing your extra tips! This recipe is to die for. I made it tonight and it was soooooo good. I made the clear version minus the chillies because of the kids and found 4 limes was enough and added more sugar and fish sauce. Tasted just like at the restaurants. It’s definitely a keeper! Thanks Mark, loving your recipes! Hi Jessie, fantastic, I’m so happy to hear you enjoyed this tom yum goong! Just love your site(s) especially the cooking one. I am going to attempt the a few – especially the soups as they look pretty easy and I just love Thai soup. The best part of your cooking videos (too me) is when you try the food…. it’s like you’re eating your first bite of food ever…..(really great expressions). If you get to San Francisco please look me up:-) I would love to give you the local’s tour of SF. Thanks again for the awesome site…. Hey Shane, thank you very much for your kind words, glad you love cooking Thai food as well! Sounds great, if I make it to SF will let you know. Thanks again! What type of chillies are thai chillies? They are Thai bird’s eye chilies. Thank you for the website sharing the recipes! I made your tom yum goong nam khon recipe tonight and it was amazing. Growing up I’m used to the nam khon version so it was very exciting for me to finally making it myself :) This is the flavour I fondly remember. You mentioned on your post that this isn’t the “fancy” type – I wasn’t aware of the other type and wondering what you meant by that. I also saw two other Tom Yum recipes on your website but have chosen this one. I think the ingredients are very similar – do you have any preference? Hi Kang, great to hear from you, thank you very much – glad you enjoyed this recipe and the tom yum. As for fancy type, I just intended that to mean that this version is the typical style you’ll find at street food and local restaurants in Thailand – not at sit down restaurants where they may use more expensive ingredients like a mixture of seafood, and serve it in a fire pot. This one is more updated than the other versions, and this is my preference. However, I went to a restaurant in Ayutthaya a few months ago, where I got to eat a traditional style of tom yum, that was incredible, so I’m hoping to make the recipe for that soon too. Thank you for the recipe Mark! This came out great! You are on the nose when you say to taste test and adjust accordingly. For my next batch (no doubt there will be many) I will make a few changes. The Lemongrass I got in here in Vegas where huge, so I’ll drop to 2 or 3. I also tossed in a few Thai Eggplant I chopped up and they came out great. Since my roommate doesn’t like mushrooms, do you have any other vegetable suggestions to substitute for them? Thank you again for posting this. I’ll be trying several more of your recipes in the near future. Hey Glenn, thank you very much, glad you enjoyed this. And yes, definitely a major part of cooking Thai food is taste-testing and balancing out all the flavors and ingredients. As for mushrooms, hmm, actually eggplant is a great idea, and I think you could really substitute anything of your liking – maybe cauliflower or zucchini, or just add more tomatoes and white onions. Happy cooking! I just tried this recipe and it is exactly the same flavor as the Tom Yum we get in our local Thai restaurant. For our personal taste, next time I would cut down the chillis to 6 instead of 10, and I used 1 regular size white onion, which I would cut down to 1/2. I used thin sliced chicken breast and shrimp as the meat and also added scallions with the cilantro at the end. I didn’t see this in the instructions, but before adding the meat, I strained out the lemongrass, lime leaves, chillis, galangal and garlic. I made the clear Tom Yum soup. I’m excited that I can finally make this at home, and so is my boyfriend! Thank you! Hi Sonya, this is awesome news, thank you for sharing, and so glad that you enjoyed this recipe. Also, I appreciate your tips and suggestions. Keep enjoying Thai food! Mark, well what can I say? One word: WOW! I’ve been looking for an authentic Tom Yum recipe for ages and I need look no further! This was fantastic. Thanks. I need to work on the effect of varying the lime juice, fish sauce and sugar. Practice makes perfect I guess. I’m struggling to get galangal here in the UK so my dish lacked that this time. I’ll have to widen my search to ensure I source a supply. Can you recommend the next recipe I should have a crack at – we love chillis and chicken if that helps! 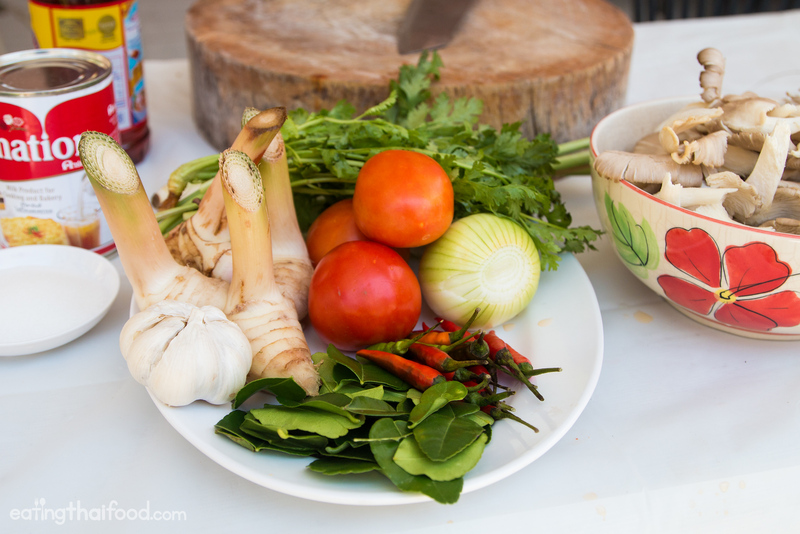 Hi Mike, great to hear from you, and I’m so happy to hear you enjoyed this tom yum recipe! 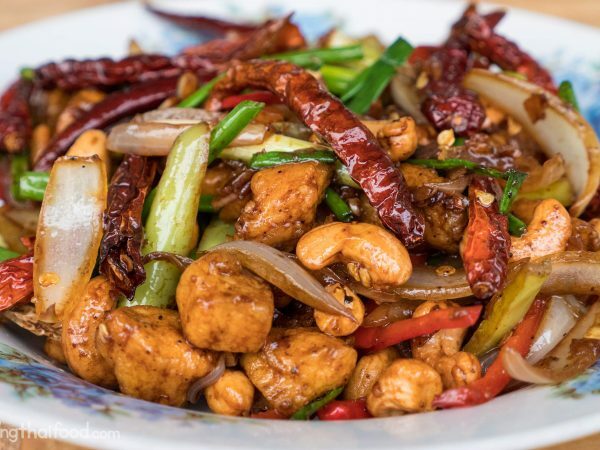 As for the next recipe, have you made pad kra pao (stir fried holy basil) yet: https://www.eatingthaifood.com/2014/01/thai-basil-chicken-recipe-pad-kra-pao-gai/ It’s one of the standard Thai dishes, spicy with chilies, and in this case made with chicken, but any meat of your choice. I think you’ll love it! Thanks again and hope you can find some galangal. Haha, thanks for sharing Fannie, glad you enjoyed it! Thanks for the recipe. I will have to find the Thai ingredients at a shop near me, then I am looking forward to making the soup. I prefer the clear broth. There is nothing like Tom Yum soup when you are feeling sick – spicy, sour and soothing. Hey Clara, you’re welcome, hope you enjoy it. Yes, I agree, it’s an amazing soup when you need a boost of herbs and flavor. I have been trying to make tom yam soup and it always turns out into a tomato soup. Your recipe is a keeper. I am sure to impress my husband with these. It works like a charm. Smells good. Looks perfect. Taste like magic. Thank you for sharing this recipe. I wish I can share a picture of my cooking. So excited! Thank you! Wow, that’s great news to hear Riyana, thank you very much for sharing, and glad that you enjoy this tom yum recipe. Happy cooking! Hey Ian, thank you very much, glad you love tom yum as well. As for the red paste, it’s probably “prik pao”? Does it come out of a can? And taste kind of sweet and smoky, and a little oily? That’s usually what they add I think. I’ve been wanting to have a go at making Tom Yum for sometime now. Looked through quite a few recipes and decided to give you’re one a try. It turned out amazing! That’s amazing to hear James, thank you for giving my recipe a try and glad you enjoyed it. Thank you for the great Tom Yum piece Mark, it was excellent and very informative. This is one of my favorite soups, and I try to order it up whenever I can. If you are ever in Calgary, Canada, look me up and I’ll take you to the “Spicy Hut” restaurant for some chow and we can stuff our faces till the cows come home. I’m sure the head chef there is Thai, although the menu is a fusion of Thai and Szechuan. The Tom Yum at this place is absolutely and brutally excellent, sporting a satisfying spicy sourness, the bowl full of all kinds of lumber from pieces of lemongrass and galangal, and chocked full with tomato, mushrooms, and prawns. It is spicy, lime juicy, salty, savoury and incredibly fragrant all at the same time. When I take a big whiff of it after it arrives at the table I almost hack my brains out from it’s intriguingly spicy and complex fragrance. I’m not sure if it’s as good as the Tom Yum you’ve been eating, but it’s certainly quality fare for my neck of the woods and I somehow know you would like it a lot. Excellent article Mark, I really enjoyed it. Keep up the great work, your videos and recipes are nothing short of awesome. As a matter of fact they are “VOONDERBAR”. I’ll make you a deal….You keep making them, I’ll keep watching them!! Hey Neil, very cool to hear from you. That’s one of the best descriptions of tom yum I think I’ve ever heard – sounds amazing – and I’m sure I would enjoy it as much as you do. I will definitely let you know if I come to visit Calgary in the future. Thank you again, I’ll try to get more recipes out soon. I love this soup. I brought home one of those stainless pots with place for a burner underneath – are those just for serving the soup at the table? Hey Noodle, yes those fire pots are not for cooking, just for serving at the table and keeping the soup hot. You can still make Tom Yum with real coconut milk too. and I heard some people even further by make Tom Yum with wipcream. Thank you Kitti, haha whipped cream, might have to try that! Tom-yum is incredible. Complex flavors that meld into something so comforting – truly is Yum! Thank you Maria, glad you love it too. Thanks for the recipe! Tom Yum Soup is my absolute favourite! You’re welcome Ashley, glad you love it also. Hey Renata, very cool to hear that, glad you love tom yum as well. Let me know how it goes!